Examination of the relationship between the women. Entry regarding Madeleine ffrench-Mullen’s arrest that appeared in the Catholic Press, Sydney, Austrailia. A documentary about Dr. Kathleen Lynn and her partner Madeleine ffrench Mullen. St Stephen’s Green/College of Surgeons Garrison, 1916. Madeleine ffrench Mullen was the eldest child of St Laurence ffrench Mullen a Fleet Surgeon in the Royal Navy. She was born in Malta in 1880 when her father was stationed there. She came to live in Ireland when her father retired. She was greatly influenced by his profession and she spent her life caring for others. According to her life long friend, Kathleen Lynn she ‘hated exploitation, want and greed. From her childhood she tried to play her part in every movement for the social welfare and betterment of people.’ Therefore it is not surprising that she was drawn into the labour movement, which endeavoured to bring about better social conditions in Ireland. 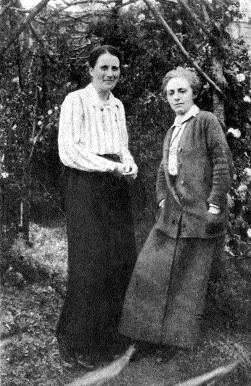 Madeleine was also an early member of the Daughters of Ireland (Inghinidhe na hEireann) the organisation founded by Maud Gonne in 1900. Madeleine wrote in their newspaper Bean na hEireann. She wrote a children’s column under the pen names of ‘Dectora’ or ‘M O’Callaghan’. She was active in the campaign to provide school dinners for children, which was started by the Daughters of Ireland. Her humanitarian motivations meant that during the Lock Out of 1913 she was one of the staff of the soup kitchen in Liberty Hall. She joined the ranks of Cumann na mBan and later the Irish Citizen Army. She met Dr Kathleen Lynn at a lecture on first aid and their lifelong friendship began. 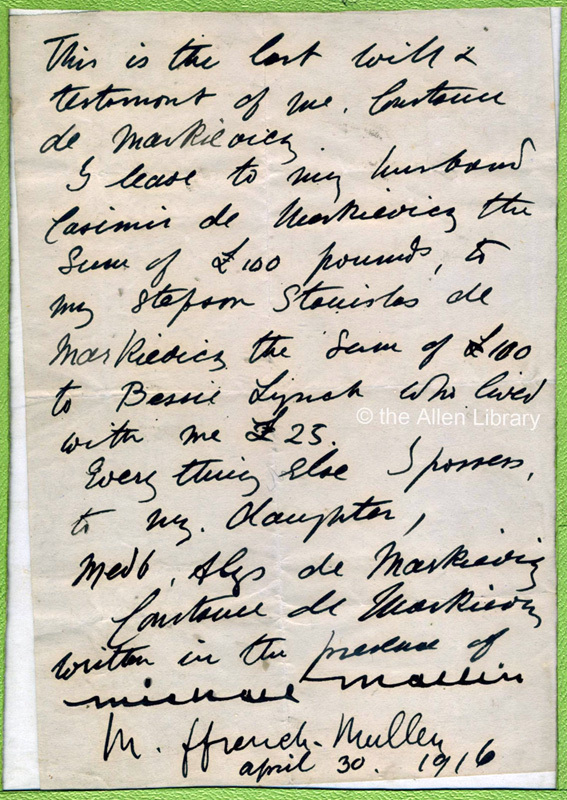 During the Easter Rising of 1916 Madeleine was part of the St Stephen’s Green/College of Surgeons Garrison. As a Lieutenant Madeleine had fifteen women directly under her command during the fighting. Her duties included overseeing the commandeering of vehicles, removing civilians from the area, guarding the entrances to the Green and tending the wounded. During the fighting she was promoted to the rank of Sergeant. She was arrested when the garrison surrendered on 30 April. She was first held in Kilmainham Jail and later transferred to Mountjoy Jail until she was release on 4 June 1916. After the Rising she worked for the Connolly Co-Operative Society, which found work for those activists who were made unemployed by their participation in the fighting during Easter Week. Madeleine was a ‘prime mover’ in setting up the shirt factory in Liberty Hall, which was in operation for a short period of time. Her life’s work was to improve the conditions of the poor. She co-founded St Ultan’s, the first infant hospital in Dublin, working tirelessly in its day to day running. In 1935 she became a founder member of the Joint Committee of Women’s Societies and Social Workers. Committed to the welfare of people in the area of Ranelagh/Rathmines she served as an Urban District Councillor and was actively involved in the Ultan’s Utility Society and the Charlemont Utility Society, that provided new homes for former tenement dwellers.